Recently, a number of schools from the St. Bart’s Trust were lucky enough to attend a workshop at Port Vale F.C. The title of the event was “Compass for Life”, an inspirational course to help enable the children to focus on their future goals and to help raise their aspirations. The event was led by Floyd Woodrow (MBE), a retired soldier and renowned public speaker in the field of leadership and improvement of performance. Floyd had an engaging manner and his interactive approach really motivated the children during the seminar. 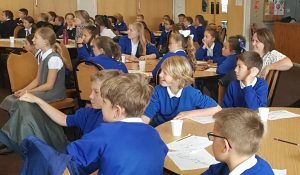 The enterprise (targeted at Year 5 pupils), will be an ongoing project which is set to continue throughout their time in Year 6 and will give the schools involved the chance to work together in the future. After an initial introduction from Floyd, the children from the four schools (Saint Nathaniel’s Academy, Cranberry Academy, Offley Primary Academy and Nantwich Primary Academy), were shown video clips of famous people who had always had huge ambitions from a young age and had strived to reach the top of their profession. This remained a theme throughout the day and was the starting point of their ‘compass for life’ – think about where you want to get to. 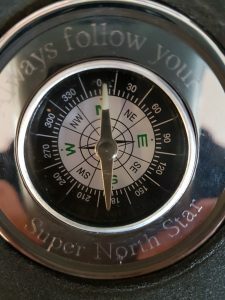 Floyd then referred to this as their ‘super north star’. With this end goal in sight, the children then had to plan out their journey and how they could get there, focusing on the compass points to help them find their way. Whilst planning their journey for success, the children were asked to consider what attitudes they would need to succeed (ethos), the way they needed to approach the end purpose (strategy) and finally, to consider the barriers they would come across and how they could overcome these (warrior). Throughout the day, there were plenty of opportunities for discussion and a sharing of ideas. The day culminated in some groups presenting the ways in which their individual school’s ethos and expectations are already leading them in the right direction to achieve in life. 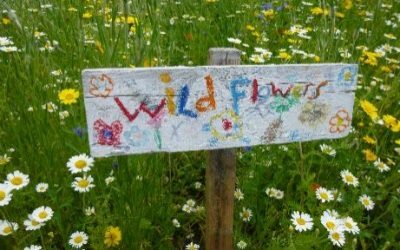 The children are looking forward to developing links with the other schools and implementing the strategies that they have learnt for the future.